Puzzle Inlay. Download Puzzle Inlay game. 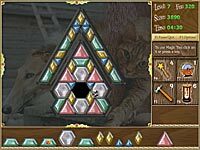 Inlay pictures with gems in this addictive puzzle game. You are offered over 100 picture puzzles to inlay with gems. You can select one of the three missions. 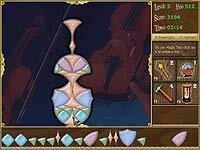 Use 18 varieties of gems, magic tools and bonuses. 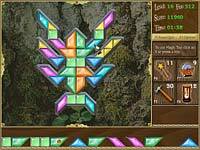 The objective of the Puzzle Inlay game is to fill the picture with gems that are delivered by the conveyor. You must be quick, because if the gem storage overfills, you lose. Use the magic tools: hammer, magic wand, transformer and sand-glass. As you move from one level to another, their difficulty is gradually increasing. The rules of the game are very simple and it takes just a few minutes to understand how to play it. A thought-provoking mosaic of delight, this puzzler will stimulate your mind and arouse your creativity. Simple to play, but a challenge to master, Puzzle Inlay is perfect for the entire family. We have no player reviews for Puzzle Inlay yet.